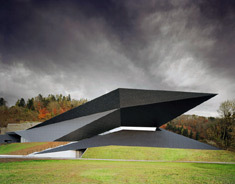 The geometry of the Festival Hall developed from the topographical conditions, placing it in an adequate relationship with the existing Passionsspielhaus. The building’s form and positioning both relate to the impressive landscape setting defi ned by the rock formations in the back, and to the dynamic presence of its neighboring historical counterpart. This existing building and the new one are oriented towards one another. They complement and elevate their respective architectural articulation of the reference to the landscape by interacting visually with one another. The new building increases existing qualities of the natural and architectural environment. Aside from the geometry, colour also enhances the duality between old and new. While the white surface of the Passionsspielhaus stands out optically during the time of the summer festival, the changing of seasons brings upon a cromatic reversal of the ensemble. The confi guration of the Festival Hall resembles a tectonic stratifi cation. Its crevices and faults lying in between indicate the way into the building’s interior. At nighttime the incisions and folds in the distinctive façade allow insight into the radiant foyer. Cloakroom and reception desk are situated near the entrance. The foyer – an asymmetric construction volume – allows manifold views onto the surrounding nature as well as onto the neighboring Passionsspielhaus. A staircase running in the opposite direction leads onto the upper gallery where the impressive relationship between interior and exterior space can be experienced again through the ample west façade made of glass. This level also hosts the building’s secondary functions. Orientation, room sequence and functional relations are integral parts of the architectural dramaturgy: ample communication areas, retracting and expanding circulation areas and varying room hights translate the building’s tectonic geometry in a sensory manner. In a consequent and effective way, the approach to the concert hall is staged through a gentle surge of the entrance level. The respective levels of the foyer are connected with the concert hall through two entrances. The latter is situated in the centre of the building like a shell, its rear part being anchored in the rock. The transition from the foyer into the concert hall is accompanied by spatial and atmospheric change: dynamism, variability and asymmetry give way to maximum concentration, static calm and orthogonality. Like the succession of rooms, the mterials concept is equally defi ned by a sensorial perception of the respective usage areas. Differentiations in geometry, haptics and surfaces of room elements increase the senorial experience of single function areas and facilitate orientation. The shine in the foyer during the winter’s sunset increases the communicative character of this area of encounter. Following the metaphor of an exposed jewel, the concert hall is defi ed by a distinct change of materials: wood surfaces and subdued colours create a warm room composition of tense quiet thus directing the visitors’ attention onto the performance to follow. Multiple technical equipment and the possibility to transform the hall allows a varied use which reaches far beyond the function of a classical concert and festival venue.